When he joined Los Angeles design firm Laney LA, architect Paul Choi knew he wanted to introduce the firm to 3D printing. Laney LA wasn't regularly using physical models, but today, they're constantly producing models to test ideas, communicate with clients, and make decisions. “Physical models are becoming increasingly rare in a field where photorealistic renderings and VR technology are advancing, but these models allow architects to test spatial qualities in ways that digital models cannot,” Choi said. We talked to Choi about how Laney LA got started with Formlabs Form 2 3D printer, and have since successfully integrated 3D printing into their day-to-day workflow. Choi’s previous employer had been using 3D printing for two decades. When he began exploring how to continue using the technology at Laney LA, a much smaller firm, he considered which type of printer would be best for their specific workflow. “I did some research and heard about how good the Form 2 machine was; it was the right fit in terms of scale and ease of use for our firm,” Choi said. Because Laney LA already had a digital modeling workflow, the transition from CAD to 3D print was seamless. Test out the pre-print process yourself: download PreForm, Formlabs free software that prepares your 3D models for printing, and import any STL or OBJ file. Find more advanced recommendations for preparing CAD models for printing in our white paper. Now, the team is constantly evolving how they leverage 3D printing. They’ve made an intentional effort to do something a little bit different with every print and every iteration, and test the limitations of the technology. Laney LA was already using digital modeling software in their day-to-day workflow, and transitioning to 3D printing was a natural next step. While they hope to scale the use of 3D printing in all phases of design, Laney LA started with printing models to mark milestones in the design process—”freezing” key moments to communicate with clients, and evaluate ideas internally. “With 3D printing, we can think of inventive ways to depict designs in physical form; to freeze designs at that moment in the process,” Choi said. Stereolithography (SLA) 3D printing makes it possible to include fine detail on even the smallest models. This example of a small-scale urban model is at 1/32” = 1’ scale and printed entirely on a Form 2 3D printer. Most of Laney LA’s projects are custom homes, so communicating the scale of a home or structure is particularly important. Usually at the end of the schematic design process, the architects will 3D print an entire design to internally assess next steps, and use as a communicating tool to present to the clients. Often, the team designs or post-processes the model to highlight various valuable aspects of a structure. “It's fun to always try to depict a certain idea about the project and isolate that through the model, whether it's a certain room or a space that we want to highlight through a section cut of the model, or even the topography of the site,” Choi said. In some cases, the Laney LA team chooses to split a model with a seam to highlight compelling interior details. 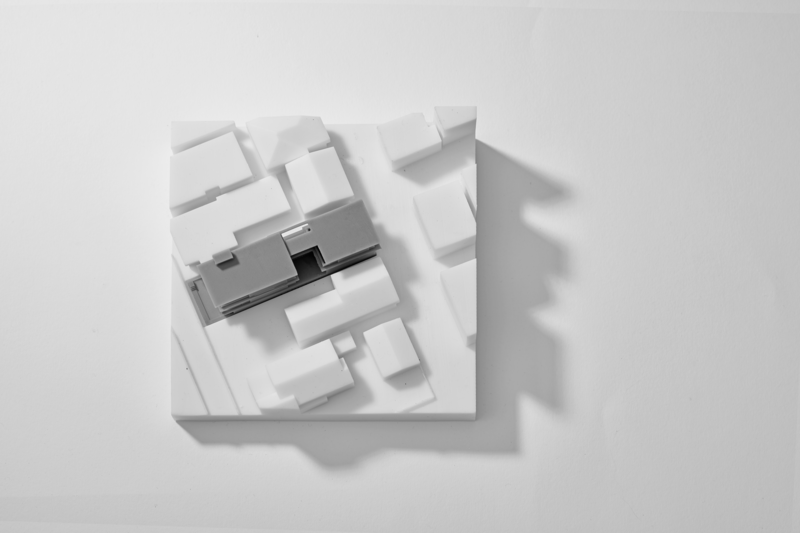 For this Culver City project, each section was one model printed in Formlabs Grey Resin, then spray painted black and white. Request a sample part printed in Grey Resin. Choi and the team also use 3D printing to showcase specific areas of the project that can be a more complicated to convey through conventional 2D drawings. For example, an architect may isolate and print a section of their virtual model to give contractors a more spacial, three-dimensional understanding of part of a design. Some elements of the construction which are less visible in the final built form (such as the framing), can be better explained in a 3D print in a much more holistic manner. For one project, the sloping site was important to communicate to the client, so Laney LA 3D printed a topographic model that highlighted increments of two-foot elevation changes. It felt natural for Laney LA to make the transition from using digital design tools to 3D printing. Choi thinks 3D printing could benefit firms with all types of workflows—including those starting from traditional techniques. “A lot of bigger offices will make the transition to a fully 3D workflow, since they have more complicated projects that necessitate more advanced project delivery, but we decided to wholeheartedly jump in because we want to be able move quickly and provide exceptional service to our clients,” Choi said. Architecture firms like Laney LA use 3D printing to bring complex digital models to life and rapidly iterate with ease. To make the most successful transition from digital model to printable file, it’s helpful to establish baseline understanding of design for 3D printing. Download our latest white paper on 3D printing architectural models to discover what you need to know to go from CAD to 3D print. You’ll learn how to approach and make smart modeling decisions, from choosing scale to designing for assembly, and how to use these strategies in common software ecosystems. Using Formlabs technology in architecture already? Share what you're working on with the Formlabs community in our forums.